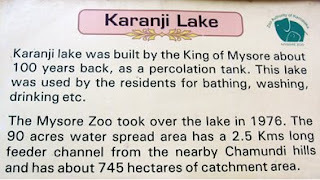 Karanji Lake, one of the oldest tanks in Mysore city, has been taken over by Mysore Zoo during 1976. The total area of Karanji lake is 90 hectares. The lake is surrounded by a nature park consisting of a butterfly park and a walk-through aviary. This aviary is the biggest 'walk-through aviary' in India. 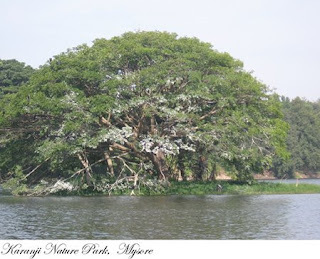 A butterfly park has been created on a small island within the Karanji lake. 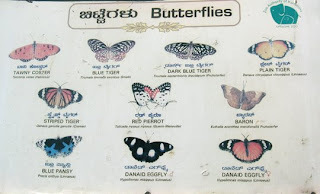 About 45 species of butterflies have been identified here. Some of the common migratory birds found here are Grey Pelican, Painted Stork, Ibis, Cormorant, Egret, etc. which nest on trees in the islands present in the lake. Recent survey of birds have indicated 87 species and 12 of them are migratory birds. Herons, Asian open bill storks, Egrets, Red wattle lapwing, Sandpipers, Rose ringed parakeet, Black Drongo, Brown Shrike, Red-whiskered bulbul, Booted warbler, Sunbird and Greenish Warbler are some of the other species of birds found here. The aviary constructed on the shore of the lake has a height of 20 m, length of 60 m and width of 40 m making it India's biggest walk-through aviary.The aviary was set up at a cost of Rs 3.8 million. It includes an artificial water fall and two small water bodies. Water from the Karanji lake is pumped inside the aviary in the form of a stream while the used water is discharged into the lake. It has about 40–50 birds of 17 species. Hornbills, peacocks, white-peacocks, turkeys and black swans are some of the birds found in this aviary. * Tariff subject to change from time to time.